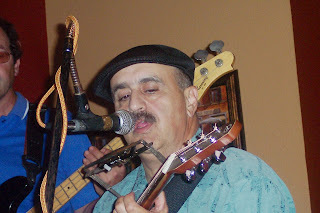 Tomorrow night,Friday January 18th From 8pm to 11pm hear John 'Scooch' Cugno at 'Liquid Soul Coffee and Music Cafe'. With Bartlett On Bass and Martin Salinas sitting in! Cool! Come down early for a bite to eat. Lots of fun, dancing, listening, relaxing. you know I'll be there. Tomorrow Night at 35025 90th South. 'Liquid Soul Coffee and Music Cafe' at the McKenna 'Y' behind Baydos. 'Liquid Soul' serves great fresh roasted, organic , fair trade coffees- The food at 'Liquid Soul' is fabulous! Great carnitas, sandwiches, salads, soups, wraps, pan dulce, desserts and more. Beer and wine and fun. Check them out at http://www.liquidsoulcoffee.com/ The phone is 360/400-soul. Kids are welcome too. "Liquid Soul Coffee Roasters & Cafe, a place to enjoy a cup of fresh roasted coffee, latte art, our secret blend Chai Tea, and even live music along with fine beer and wine. A place you can enjoy breakfast along with our very own signature pastries, lunch, or unwind at the end of the day. We have plenty of room for large gatherings, private parties or company meetings. We also offer an in house PA system, including a DLP Projector with a 106" screen." From the Liquid Soul Web Site. Click here to check it all out. http://www.liquidsoulcoffee.com/ or phone 360/400-soul. Check out their new My Space Site here too h ttp://www.myspace.com/liquidsoulcoffee John 'Scooch' Cugno has 2 CDs available at www.cdbaby.com . One CD is called 'Blue's Survivor' and the second is 'Nothin's Easy' Come on down to hear the Blues.